OK. Behringer equipment has a reputation for poor quality and short lifespan, so you don’t have to tell me about that. But, I needed a really cheap and simple mixer and the Behringer Xenyx 502 has worked out great, and provided a nice surprise too – this thing make a great headphone practice amp. It is really inexpensive, with a list price of $87.99 and a street price of $39.99. This price point worked well for me because I needed something cheap to use for small parties and situations where I did not want to bring my nice mixer and takes chances by leaving it unattended (spilled drinks and curious children, you know). The Xenyx 502 can do quite a bit for $40. It has 5 inputs, including and XLR and four ¼-inch jacks. The manual does not say if it has phantom power and there is no switch, but it appears to have it as my condenser mikes work fine with it. There are also RCA inputs in case you want to hook up an iPod or CD player, and this input can be sent to headphone output or the main mix outputs. These outputs include two ¼-inch jacks, a ¼-inch headphone jack and RCA jacks (in case you are doing some recording). This Behringer unit has a sturdy chassis, and I have managed to not break off any knobs in the year and a half that I have been using it. And that is really saying something, as it has hit the floor hard a few times. You see, the mixer’s small size is no match for the huge in-line power transformer that is on the power cord, which has dragged it off of a few tables. As far its performance, I am satisfied with this purchase. It provides a quiet signal with no extra hum or buzz, and not much alteration of the source sound. I have not found myself wishing for more knobs or inputs in the situations I’ve used it in. Of course there is only one XLR input, but I knew that going in and I was looking for the cheapest alternative. The surprise I got is that this mixer works great as a guitar practice amplifier. I can plug in my iPod and guitar, and use the headphone out to listen (in stereo, no less). 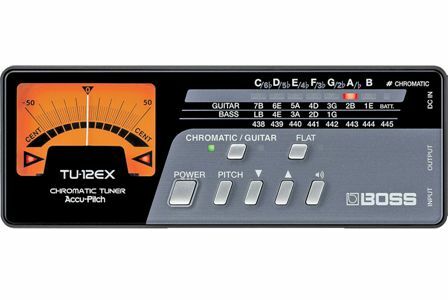 It is quite a bit more versatile than a lot of the practice amplifiers I’ve tried, and a whole lot cheaper. There are a few things I do not like. The world’s brightest LED, which makes it hard to see the controls. No power switch, so you have to unplug it to turn it off. And a power supply that is almost as big as the mixer. Oh yeah, and I do not know what a Xenyx is. Today we are going to take a look at the Shure SM57 microphone. It is not really a review, because it is one of the best-selling microphones in the world, and it sales speak for its quality. The SM57 is a unidirectional low-impedance microphone that was introduced in 1965. It has an XLR connector with balanced output, to minimize unwanted noise and hum and a cardioid pickup pattern so it can isolate the target sound source and without picking up very much background noise. This microphone has a frequency response of 40 Hz to 15kHz, believe it or not. SM stands for “Studio Microphone”, but I think that most of these are used in live performance situations. SM 57 microphones work very well for picking up drums, guitar amplifiers and wind instruments, but they are often use for vocals too. I mostly use mine for mic-ing guitar and bass amplifier cabinets, and drums on occasion. They have a well-earned reputation for durability, and I have never seen one break. 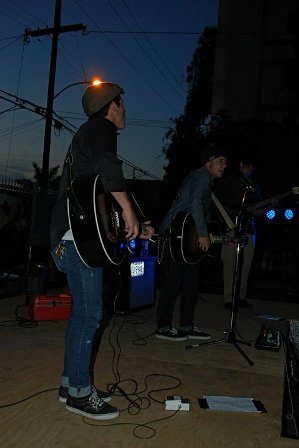 If you do not have a Shure SM57, you need to buy one. They have a list price of $146, but you can buy them anywhere on the internet for $99. Be careful if you see a deal that looks too good to be true, as counterfeiters have stated knocking these out too. A while back I wrote about one of my original issue Fender Lone Star Stratocasters (I’ve had a few), and thought that maybe I should fill in some of the blanks about the history of these guitars. In 1996 (Fender’s 50th anniversary), Fender issued a handful of special edition Stratocasters with features not found on their American Standard guitars. 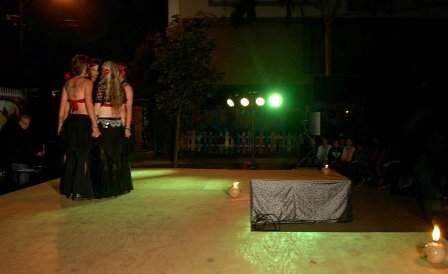 Among them were the Roadhouse, Big Apple and Lone Star Models. The Lone Star Stratocaster was an American Standard Stratocaster with an upgraded electronics package that included a Seymour Duncan Pearly Gates humbucker at the bride and two Texas Special single coil pickups. They were available in a light Sunburst or Olympic White with a tortoise shell pickguard, and Black, Candy Apple Red, Shoreline Gold or Teal Green Metallic with a white pearloid guard. These guitars were only available with tremolo (no hardtails) and sealed chrome tuners. Necks had maple or rosewood fretboards with 22 frets pressed into them. My only real beef with these guitars is that they have really bulky bodies, quite unlike the profile of the original Stratocasters. By the way, all of the ones I have seen have swimming pool routes in the bodies. Some folks sniff at them, but I do not really think they change the tone that much. The tone is typical HSS with a pretty good growl from the bridge pickup, and clean highs from the two single coils. So, the Lone Star Stratocasters are very good for rock and blues, but they do not sound like a Stratocaster. A lot of these have been changed into the SSS configuration just for this reason. In July of 2000, the Lone Star Stratocasters morphed into the American Series Fat Strat Texas Special, with the same pickups and other improvements that the American Standard Series guitars received. Then, in July of 2003 Fender discontinued the Texas Special and introduced the American Series Stratocaster HSS. They changed the pickups to Fender Tex-Mex single coils and a Fender Diamondback humbucker, and installed S-1 switching. Finally, in December of 2007, they announced the American Standard Stratocaster HSS, which kept the Tex-Mex and Diamondback, but lost the S-1 switching. They also got the upgrades that the American Standard Stratocasters got, including the rolled fretboards and the heavy bridges with bent saddles. It should be noted that there is once again a Lone Star Stratocaster in the Fender line-up. This one is made in Mexico and has same pickups and features as the original for a lot less money ($899.99 MSRP) than the American Standard Stratocaster that has a list price of $1569.99. Check one out! Today we are looking at a stunning custom guitar color, the Blue Dawn that was offered by Ernie Ball on their MusicMan guitars and basses. Blue Dawn is a metal-flake sparkly blue burst (or fade, as the hot rod guys call it). This color was originally introduced in 2001 and was discontinued after a year or two due to lack of demand and difficulties in shooting heavily metallic finishes. Members of the MusicMan forums complained that they could not get Blue Dawn instruments any more, and it was eventually released again as a limited edition in 2007. They limited edition instruments came with or without matching headstocks, and were available on most models in their line-up. Of course they did not have Bongo basses back in 2001, but they did in 2007, and Blue Dawn looks spectacular on them. These instruments all came with 3-layer black pickguards (the ones that came with pickguards, anyway) and chrome hardware, which are tasteful additions to an otherwise aggressive color scheme. Each 2007 Limited Edition model also had a “2007 LE” inlay at the 12th fret, and shipped in a custom blue G&G hardshell case with a limited edition badge inside. Other than these differences these instruments were configured the same as the usual MusicMan instruments. I have owned a few Blue Dawn guitars and basses (2 Sterling basses and an Albert Lee guitar), and they were certainly lookers, with all of the quality workmanship I have come to expect from MusicMan. Check one out if you get a chance! 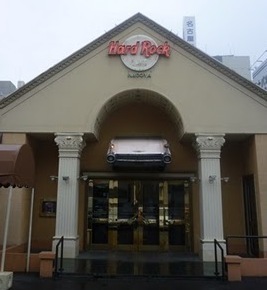 On a recent trip overseas I made the sad discovery that the Hard Rock Café in Nagoya, Japan had gone out of business. This was one of my regular haunts when I came to town, and it will be missed. This Hard Rock Café location opened on July 1, 1997 and closed on December 31, 2010. When I started going there in the late 1990s, it was always crowded, which was amazing because it was a huge place (especially for Japanese real estate). It had to help that the Hilton hotel across the street was chock full of foreigners and tourists that were looking for cheeseburgers, beer and souvenir t-shirts. 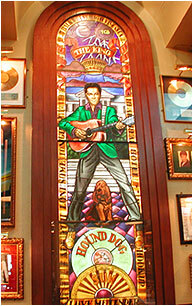 It had the usual bunch of rock and roll memorabilia, and a few extras, such as the Beatles ceiling mural and the Elvis stained glass window. 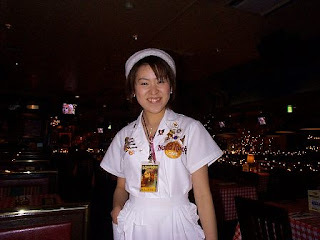 Looking around you would not know you were in Japan, because it looked like every other Hard Rock Café in the world. The staff was always great, but then again this is Japan, where they know how to do customer service right. They would lead the crowd in the YMCA dance and every hour they would play the Beatles birthday song (at top volume). The food was ok, which is really all you can say about the food at most Hard Rock Cafés. It was certainly more American than Japanese, until you considered the prices. There are not many places in the world where you can buy a $20 hamburger or a $25 pitcher of draft beer. After the new Marriott Associa hotel was built, the foreigners stopped staying at the Hilton, and the Hard Rock was not crowded any more. And after the recession of 2008, business completely dried up, and the owners finally gave up when their lease ran out at the end of 2010. The rent could not have been cheap for a place that big. Geddy Lee of Rush is a legend in the bass community, and he is a joy to watch during live shows as he is an incredible player. 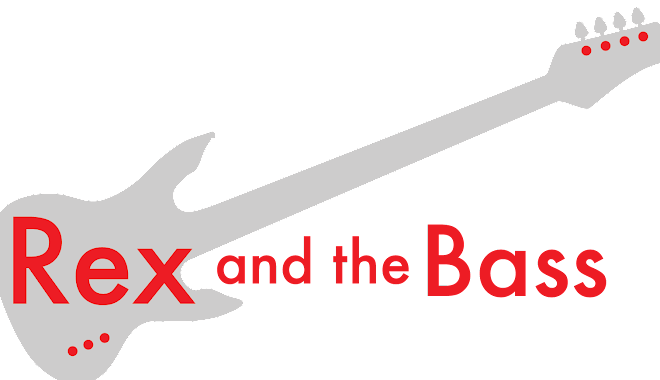 Over the years he has used basses from Rickenbacker, Steinberger, and Wal, but Fender is the only company that has honored him with a signature model. The Fender Geddy Lee Jazz Bass was introduced in 1998 as a replica of the 1972 Fender Jazz Bass that he bought in a Kalamazoo, Michigan pawn shop. They have been a good-selling model and are still being made today. These basses have an alder body finished in black poly, or in 3-tone sunburst (as of 2009). They are loaded up with a couple of passive vintage single-coil pickups, wired through the traditional volume/volume/tone controls. The hardware is chrome, and includes large-plate vintage tuners and a Leo Quan Badass II bridge. The neck is the most special part of the bass. It is poly-finished maple with black blocks and binding, as well as Geddy’s signature on the back of the headstock. The fretboard has a 9 ½-inch radius fretboard with 20 medium-jumbo frets set into it. The profile is completely different than other Jazz Basses I have played. It has the expected 1.5-inch wide bone nut, but it has a very thin C-shape to it. These basses are all made by Fender in their Japanese workshops, and the craftsmanship is top-rate. The finish is glossy and even, and the fretwork and neck pocket fit have been great on every example I have seen. I have owned 6 of these basses, and they all played and sounded great. I had each of them set up with Rotosound Swing Bass 66 Stainless Steel round-wound strings, just as Geddy uses on his. But, I have had necks go bad on two of them, which required that they be sent back to Fender for replacement. I think this is because they have made the necks so thin that they became unstable. Admittedly this is a small sample, but 33% is not a very good failure rate. The Fender Geddy Lee Jazz Bass has a list price of $1399.99, and a street price of $1000. This includes a deluxe gig bag and a nice warranty, Check out the new sunburst Geddys, they are breathtaking! I did not really need this amplifier, but recently picked it up in a Craiglist package deal with yet another amplifier and speaker cabinet. I had forgotten what a great amplifier the Gallien-Krueger 400RB is. Gallien-Krueger was started by a couple of HP engineers back in the early 1970s and became one of the most popular bass amplifier manufacturers in the world. They were pioneers in lightweight high-power solid state amplification. Their first iteration of the 400RB was introduced in 1982 as a scaled-down version of their 800RB amplifier. These amplifiers were hugely popular back in the day, and I still see them regularly at gigs. They are reliable, loud and sound pretty nice. This 400RB amplifier weighs in around 15 pounds, and measures approximately 17.5" wide by 4" high by 9.5" deep. You can mount it in a standard size rack if you replace the amplifier end caps with rack ears. For its weight the power output is good, with 200 watts at 4 ohms. The 400RB is a classic-looking amp, with a crinkly-finished metal case. There is a handle mounted to one end of the case in case you decide not to go with a rack case. The front is uncluttered, with a neat line of controls. 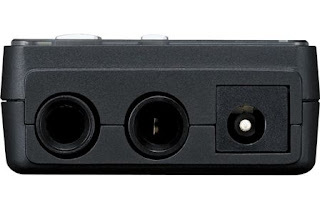 There is one ¼” input jack (a 10db cut switch is included) and a volume control. Tone controls include 3 filter switches (low cut, mid cut and high boost), and a 4-band equalizer. On the output side there is also an adjustable footswitch-controllable boost circuit with its own input jack and a master volume knob. The back of the case is very simple with a direct out, an effects loop and two ¼” speaker outs. I opened this one up to see what was inside. The wiring is tidy and nicely routed, and there is a huge transformer. Gallien-Krueger eschewed a cooling fan and went with a great big heat sink on the back of the chassis instead. Through my Ampeg cabinet (with an EV 115L) or my Genz 12-inch cabinets the 400RB amplifier is amazingly loud for 200 watts. It has a very smooth tone and has a lot of character that I do not usually associate with older solid-state amplifiers. It also has great lows and low-mids. I had planned to sell it, but have kept it around because it has a different tone than my Genz or Ampeg amplifiers. In nice condition, Gallien Krueger 400RB bass amplifier sell for $150 to $200, but you should keep in mind that there were some changes to these amplifiers over the years, and they do not all have the same features. The one that I have is a Series I amplifier that was built in 1989. The original Series I amplifiers required a footswitch for the boost function to work and had a permanently attached power cord. 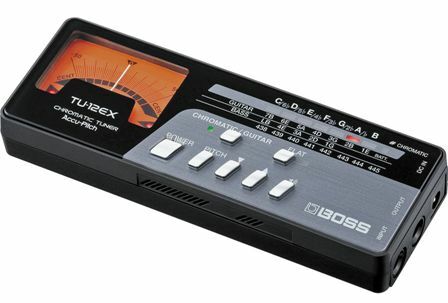 The Series II was the same amplifier, except the boost worked without a footswitch (a footswitch could still be used, though), and it had a detachable IEC power cord. The Series III was a new design with increased power output as well as new features including: variable voicing filters for contour and presence, a tuning mute switch, a cooling fan and an XLR balanced direct out. These amplifiers put out 240 watts at 4 ohms. Series IV was the final production version of the 400RB with the same features as Series III and 280 watts of output at 4 ohms. They are all good amplifiers, but I prefer the sound of the Series I best. Try one out if you get a chance! 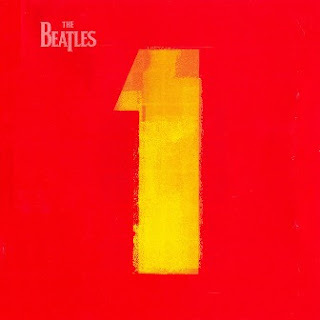 I recently downloaded The Beatles 1 from iTunes, as it was on sale for 10 bucks, and it seemed like a neat compilation that would fill out a few of their more popular songs that I did not have. My kid loves it too, so it was a worthwhile purchase. 1 was the brainchild of Capitol Records, who wanted to create the best selling album of all time, besting Thriller and The Eagles Greatest Hits 1971-1975. The concept was to include all of their number 1 hits from the UK and US, which seems like a tidy way to put a collection together (until you start figuring out whether to include B sides and whatnot). Of course, there were a lot of great Beatles songs that never hit number 1, so they are not included. I guess you have to draw the line somewhere. And, if you already have their entire catalog, this album would be a bit redundant. The Beatles 1 was released back in 2000, on the 30th anniversary of their breakup. It included 27 digitally-remastered tracks, and was available on CD, album or cassette formats. Remember cassettes? The version I bought was re-mastered in 2011 without the use of Sonic Solutions NoNoise digital noise reduction nor heavy digital limiting (as it was in 2000), and it is a very clean and natural-sounding collection of music. If you do not have the complete Beatles catalog, you should pick up 1, there isn’t a bad song on it. In the end, Capital was not successful in beating Michael Jackson or The Eagles. 1 has sold 11 million copies in the US, compared to 29 million for the leaders, and there are actually quite a few other Beatles albums that have sold more copies than the 1 album. Though I am sure they made dump trucks full of money anyway, it is nice to see corporate hubris take a beating. Today we are looking at my Fender 1959 re-issue Precision Bass that is a real peach. It is finished in Vintage Blonde nitrocellulose lacquer over an ash body, and it was built by the Fender Custom Shop. It is a Closet Classic, so it has a very light relic treatment. This would be model 015-2100-807 in Fenderland. The quarter-sawn maple neck has a comfortable C profile and a 1 ¾-inch nut width. It has a 7.25-inch radius to the fretboard, and there are 20 vintage-style frets seated into it. The truss rod adjusts at the heel, so the anodized pickguard has to be removed to adjust it. The hardware is faithful to the original. This Precision Bass has nickel/chrome hardware with vintage-type reverse tuners and the bridge has threaded saddles just like the original. The electronics are simple with volume and tone controls wired to a Vintage ’59 split single coil pickup. There is no extra noise and the pickup is punchy with good output. As far as the appearance of this Precision Bass, it has been factory reliced, so there are a few nicks some lacquer checking and wear. But it was tastefully worn and not over the top, as some their later relics are. Overall, it is very well made. The frets are well done and the action is very low and playable, which is a great complement to the C neck profile. A bonus is that it is not terribly heavy, coming in at 9 pounds 1 ounce (according to my scale). p>This bass looks and sounds authentic, and I appreciate the trouble the guys at the Custom Shop went through to recreate this bass. And these basses did not come cheap. This Fender Custom Shop ’59 Precision Bass Closet Classic had a list price of $3696 back in 2008 when this one was built. There is really no so thing as a keeper in my collection, but this one gets very close.